Young victim succumbs to critical wounds after being accidentally shot by gunfire intended for terrorist. One 30-year-old Israeli victim was critically wounded by errant gunfire during a stabbing attack attempt by an Arab terrorist on Wednesday in the Gush Etzion region of Judea. The victim later succumbed to his wounds and died. He was identified by the Gush Etzion Regional Council as Eliyav Gelman, an IDF officer in reserves and a resident of Karmei Tzur. The date of the funeral has yet to be determined. The terrorist was shot and neutralized by IDF forces, and was hospitalized in moderate condition. Gunfire intended for the terrorist hit the victim instead, according to an army appraisal of the incident. 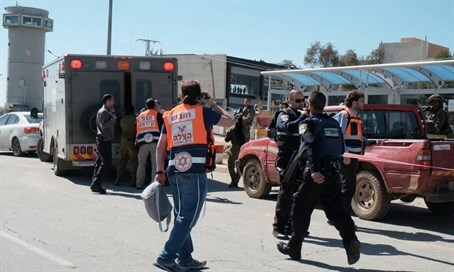 The victim suffered gunshot wounds to the upper body after being attacked at a hitchhiking station at Gush Etzion Junction, which has been the site of lethal attacks in the past. Magen David Adom (MDA) teams were called up to the scene and began providing medical treatment before evacuating the unconscious victim to Shaare Tzedek Hospital's trauma unit in Jerusalem. The Arab terrorist was likewise evacuated to the hospital's trauma unit. Video from the scene of the attack was uploaded to Facebook by the Arab Shehab News Agency, and can be viewed by clicking the image below.